There have been warnings about how it has become easier for new Chinese DRAM manufacturers to enter DRAM market as increase in DRAM price has become excessive. Even if production yield is not positive, new businesses can make profits if DRAM price continues to stay high. This indicates that technical barriers are becoming lower. 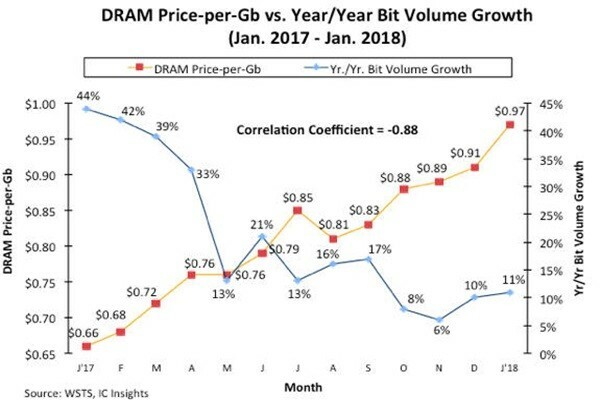 According to a market research company called IC Insights, it submitted a report that shows that the price of DRAM per Gb (Gigabit) in January ($0.97) was 47% higher than the price of DRAM in January of last year ($0.66). This kind of trend is unprecedented and it surpasses the highest price increase (45%) that happened 30 years ago in 1988. A reason why there is such a huge increase in DRAM price is because number of supplies is less than number of demands. Industries believe that Samsung Electronics, SK Hynix, and Micron, which survived a battle of chicken within DRAM market, are currently enjoying sweet results of surviving battles of chicken. When cutthroat competitions where DRAM manufacturers increased number of their supplies outrageously started to disappear, number of supplies has become insufficient which is causing DRAM price to increase continuously. According to IC Insights’ data, DRAM price fell 33% annually between 1978 and 2012. After DRAM industry has reorganized itself into Samsung Electronics, SK Hynix, and Micron, annual fall rate of average DRAM price was only 3% between 2012 and 2017. Annual bit volume growth, which shows trend of output of DRAM, was 20% in 2017. Especially from May of last year until January of this year, monthly average bit volume growth was only 13%. Because increase rate of supply is not much, DRAM price can only go up continuously. Increase rate was between 60 and 70% when battles of chicken were at the peak. However when number of supplies had gone up, memory manufacturers always made losses in the following year. “There is no question that system manufacturers are having difficult times due to high DRAM price.” said IC Insights. It explained that high DRAM price is limiting capacities of DRAMs of major electronics such as PC and Smartphone from increasing. Recently, China’s major system manufacturers backlashed at high DRAM price. It is heard that National Development and Reform Commission even sent a message to Samsung Electronics, which is the top business in DRAM industry, about negotiating its DRAM price. IC Insights warned that current memory manufacturers may be revenged by their customers in the future when new Chinese DRAM manufacturers are able to produce competitive products within couple years. If DRAM price continues to stay high, it will be easy for new DRAM manufacturers to enter DRAM market as they can make profits even though their business is not comparable to that of Samsung Electronics and SK Hynix.